This old favorite's gone bigger, better, and brew-friendly. There's room for beer in every board game. Just ask Ryan and Kim McDaniel, who doctored an old favorite to make it bigger, better, and brew-friendly. 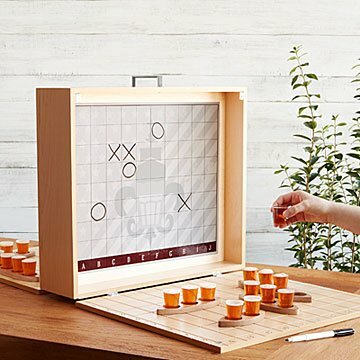 Play against a friend or in teams of two to track down your opponent's shot glass-laden "ships." Every time you guess a coordinate correctly, they drink! Great to play outdoors or in for a quick dose of grown-up nostalgia. Handmade in Missouri. Includes plastic shot glasses and 2 whiteboard markers. This is a made-to-order item. If you order today your item will ship no later than 5/20/2019. High quality product that is beautifully made.